During my tenure at WireMedia Communications, Bravo Holiday Residences was one of our major clients. I was the main liaison on this project, providing ongoing web maintenance and support for their sprawling site of Italian vacation listings. 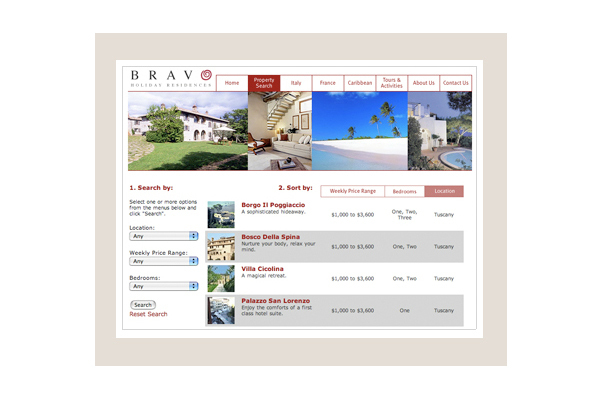 Property Search: In addition to providing print brochure and web updates, WireMedia overhauled the online property search of Bravo Holiday Residences. This feature, previously a manually maintained monster, was streamlined and databased for more efficient functionality. These changes to the property search also cut costs for the client, who no longer had to pay to maintain hundreds of individual pages of content. I was the main project liaison, the chief provider of ongoing web maintenance, and managed the the user interface and info architecture analysis for the property search overhaul. 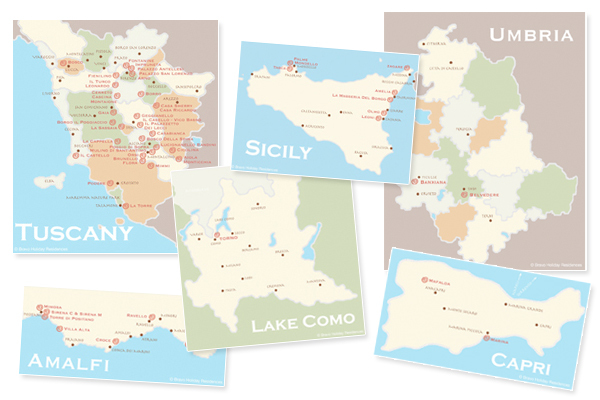 Map Redesign: Bravo had previously used unrelated maps for each area of Italy — my redesigned versions presented all maps in the same illustrated style, creating a clear and consistent language of information. Bravo vacation properties were marked by their trademark red swirl. The maps were used in print and online, where the villas were individually image mapped so that each property could be linked to its listing. Editorial: Bravo was constantly updating, tweaking and expanding their listings. On a weekly call, the client and I would comb through listings and finesse language so that each property’s description was as accessible, appealing and correct as possible. We eventually started adding local highlights and travel tips to individual listings and regions.